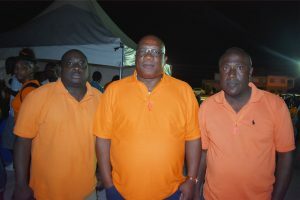 BASSETERRE, ST. KITTS, December 3, 2018 (PLP PR Media Inc.) — Hundreds from Constituency Number Seven and the country on a whole turned out to join in a huge motorcade that was part of a calendar of events as the constituency celebrates 25 years of quality service rendered by their Parliamentarian, Prime Minister Dr the Hon Timothy Harris. The hugely supported event which took place on Saturday December 1, saw the motorcade snake its way from the historic Black Rocks in Bellevue through the length and breadth of the constituency and right into Cayon (which is outside the constituency), and tuning back to Bourryeau Gate. At the Bourryeau Strip right opposite Fraites Bakery was a Youth Concert that was to start as from 7:00 pm. Prime Minister Harris, who is also the National Political Leader of the Peoples Labour Party (PLP) one of the three parties in the Team Unity Administration, was at the starting point quite early where he mingled with the excited constituents and other visitors to the historic Black Rocks among them a group of tourists on a guided tour bus – a converted truck. The driver, and guide, proudly told the tourists on his bus: “This is our Prime Minister Dr the Hon Timothy Harris who is celebrating 25 years since he was elected to parliament and has successfully kept on being re-elected.” At that point the tourists tried to get a glimpse of him with some thrusting theirs hands out, and the Hon Prime Minister did not left them down as he shook hands with those on the left side of the converted truck. 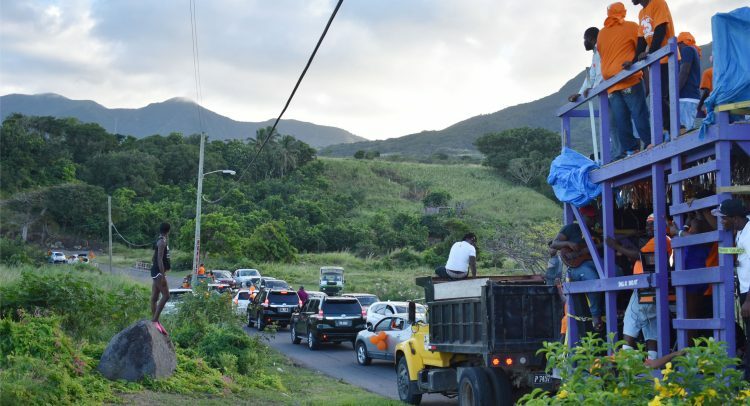 A team of police officers led by Inspector John Bergan of District ‘B’ were on hand to lead the motorcade, and along the way assisted in disentangling massive traffic jams that ensued especially at the entrance to Tabernacle Village as the motorcade participants re-joined the Island Main Road. Music was provided by Tension Band and Ronnie Rascal. From Black Rocks the motorcade entered Tabernacle Village, which is Prime Minister Harris’ home village. While the Prime Minister’s official convoy was part of the larger motorcade, he was in a white medium sized SUV that had huge loud speakers mounted on top. The Honourable Prime Minister was using a mike and was along the entire motorcade route thanking his constituents for the support they would have consistently given him over the last twenty five years. All along the route of the motorcade, villagers came out waving and many of them blowing whistles as they shouted, ‘Harris Again!’ A team of boys on bicycles welcomed the motorcade as it entered Tabernacle Village moments after a St. Kitts Scenic Railway ‘Sugar Train’ full of tourists passed on its way back to Needsmust. According to Mr Phillip, the motorcade was incident free, and he profusely thanked police officers who were fully alert and ensured that everything went on smoothly especially in controlling and directing motorists who were travelling in the opposite direction.